Crabbie's Grand National day could hardly have started in better fashion for Willie Mullins, whose Nichols Canyon, the 3/1 favourite, landed the Grade One under a determined drive from Ruby Walsh. The trainer confessed surprise at his five-year-old's convincing triumph, by four and a half lengths, saying: "I didn't expect him to do that. When I was legging Ruby up, I thought his coat had gone a little bit and I said: "this fellow could run flat today" - one or two of ours had run flat during the week. "We went back to our old tactics. I said to Ruby that we would do what we did at Leopardstown and forget about Cheltenham. "It's a wing and a prayer running horses here after Cheltenham. You come from Cheltenham, you try and recover from it, you are looking at Aintree and saying "will I or won't I enter him?". We entered him and then there's the question of "will I or won't I work him?" "I think that he might have got one or two bits of work but really you can't work them as they are fit as fleas going to Cheltenham. You just want to not do too much and hope that the horse's own ability will win. That's what we try and do." Mullins indicated that the winner may swerve the Punchestown Festival and added: "I'd probably like to go back to the Flat. I may have to ring [Nichols Canyon's former trainer] John Gosden and ask his advice." 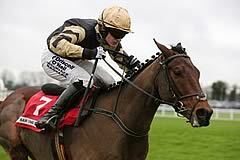 Jockey Ruby Walsh began John Smith's Grand National day on the best possible note when winning aboard Nichols Canyon. "Racing is a great game - ups, downs, ups downs - that's just the way it is. This place is a wonderful place to be on Grand National Day with the crown and the atmosphere and this horse nailed it today," said Walsh. "He was just too keen at Cheltenham and I never got him to switch off. I only got him settled by the time we got to the second last. He was much more relaxed, he got a bit keen turn out of the back last time but that's when you want a horse to get switched on. At the third last I got a lovely split and joined Daryl (Jacob on Ballybolley) and I wasn't going to get beat from there. "I got to the start and had it in my head that, if I wanted to make it, I was going to make it and, if they went a gallop, I was going to sit in. Daryl also wanted to make it so I was happy to follow. "He settled like a lamb today, jumped like a bunny and quickened up well to win. He is tiny and the ground was plenty quick enough for him. He'd appreciate slower ground but the track's In great condition. "We'd thought about going to Fairyhouse but he'd have had to carry a penalty so the obvious thing was to come here. "It's great to get back on track and great to win. The owner's husband is off caddying at Augusta but at least Andrea is here."